I have finally finished another one of Colin Thubron's books and I am so relieved! Can't say why, but I find his books extremely tiring. Must be my brain having problems processing all those lofty words. Do I sound a bit sour here? If I do, let me immediately admit it might be good old jealousy. Thubron is a vocabulary master. I don't think I can even hope to ever match his skill with words. I'm duly impressed, but I also can't help wondering - are all those majestic phrases really necessary? I guess I belong to the 'if something can be said in simple words, don't complicate it' school of thought. The fuzziness of my head after three hundred pages of linguistic challenge might have something to do with it. The Lost Heart of Asia describes countries rarely chosen as travel destinations: Uzbekistan, Turkmenistan, Tajikistan, Kyrgyzstan, Kazakhstan. Thubron pretty much sprints through each, visiting main cities and meeting local people. As the book was published in 1994, it inevitably deals mainly with the aftermath of the fall of the Soviet state. Seen through this lens, all the 'stans' appear spookily alike although I'm sure much has changed since. Even though economic realities described in The Lost Heart of Asia are rather grim, its pages sparkle with legendary names. 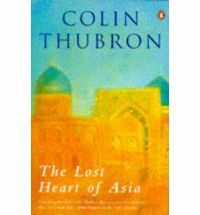 Thubron is generous with his historical knowledge, so a reader can glimpse Central Asia as it was in its ages of glory - fierce, powerful, awe-inspiring. I was a bit unsettled by the number of necropolises mentioned in the book. Hardly a page goes by without a grave, a tomb or at least a mausoleum being mentioned. While I realise that this land has been plagued by violent history, I'm sure there's more to it than cemeteries. Still, I could imagine a worse introduction to the heart of Asia, lost or not. After two samples of Thubron's writing in a row I'm under impression that he is a great writer but only an average traveller. He rarely gets into trouble. He does not express controversial opinions. One feels he only skims the surface, instead of digging deep into the soul of the land he travels. Still, he is a damn good wordsmith. That's good enough for me.